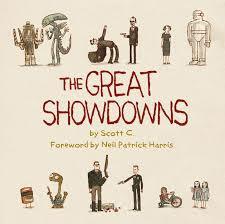 California born Scott C. left University in 1992 with dreams of illustrating comics and children’s books for a living. Eight years later he started working on some of the most beautiful computer games ever created, including Psychonauts and Brütal Legend. He also achieved his dream, working on comic books such as Double Fine Action Comics, Project: Superior and Hickee. This book seemed like such a great concept that I was instantly intrigued and after spending an evening flicking through the pages of this book, I was hooked. The idea sounds simple but once you start to recognize the characters and Scott C.’s humour begins to unfurl, this book will really bring a smile to your face. A few of my personal favorites include Dennis Nedry vs a Dilophosaurus (spitting dinosaur) from Jurassic Park, Travis Bickle vs a mirror from Taxi Driver and Renton from Trainspotting vs one seriously dirty toilet. Movie buffs can be a bit of a nightmare to buy for at Christmas, especially if they’re the kind of person who sees the movie the day it’s released at the cinema and buys the film the day it hits the shops. Well, this book is the answer! It’s great fun, strangely addictive and an absolutely great gift book.